Description: A well-known, hardy species that has been cultivated by gardeners in several countries for more than a century, P. aurea (best known to older gardeners by its former name of P. longiflora) has been used in hybridising and is still available from some specialist nurseries. Characterised by the ‘shuttlecock’ flower heads, which range in colour from creamy white through pale pink shades to almost red, this species is particularly colourful from late summer through autumn into winter. P. aurea forms a 3 m tall, bushy shrub with an obvious trunk. It has variable foliage, with some forms having leathery, shiny leaves, while others are softer and hairy. Although an attractive species, this protea is not usually regarded as a cut flower subject, but when picked at the soft bud stage it will gradually open in the vase and have a useful life of up to a week before the long styles collapse. 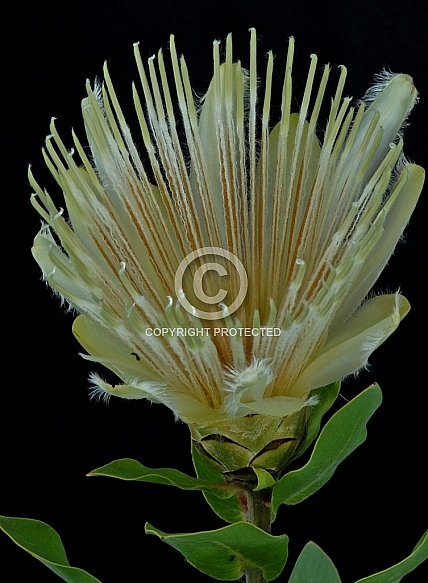 This is one of the more cold hardy protea species, tolerating temperatures as low as -8 ºC once established. It is easily grown and long lived in most well-drained, average soils. Sunny positions are a prerequisite to good flowering.